After testing different shirt colors we found that Charity Team runners not only look best in red, but they are also faster in red. And each step is to help kids! 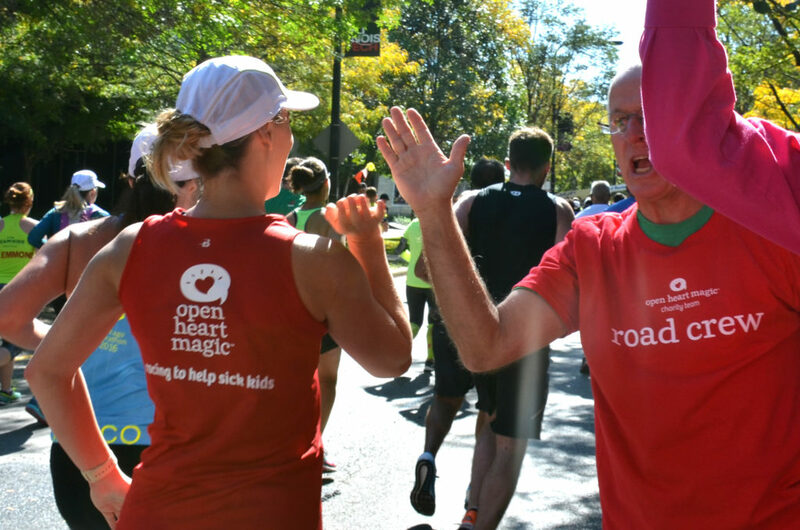 The miles run and the funds raised by Open Heart Magic’s Charity Team inspire and support our Hospital Magicians in their efforts to reach more than twelve thousand sick kids each year. Thanks to the impressive dedication of athletes on our Charity Team, Hospital Bedside Magic® is able to go where other programs don’t — to reach kids at critical moments in their treatment. Race with a purpose. Fundraise for Bedside Magic®. The Charity Team is critical to Open Heart Magic’s mission of bringing laughter and hope to kids in hospitals. And with our low fundraising requirements, team members find that fundraising’s a breeze. 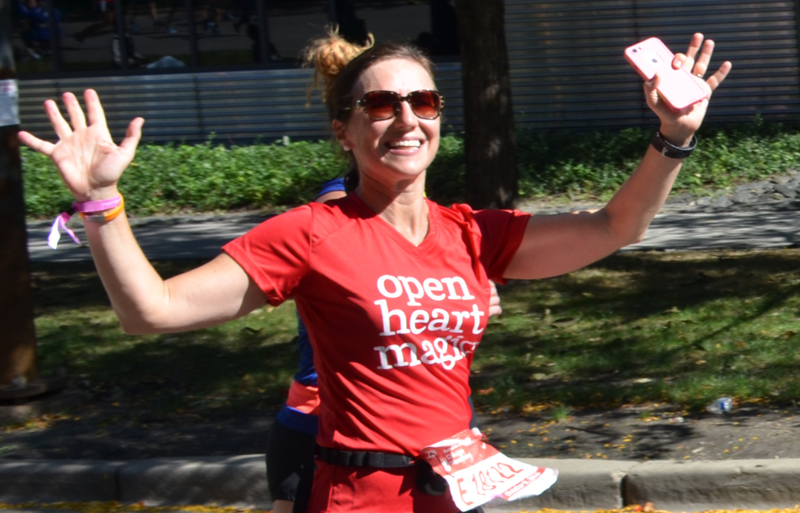 Whether team members are competing, training, fundraising or just spreading the word, they get lots of support from the Open Heart Magic community. Our 2019 Bank of America Chicago Marathon spots with guaranteed entry are now available! From 5K runs to marathons, and bike races to triathlons, Charity Team members don’t need to finish first to be number one in our book. Team members have competed in 5Ks, 8Ks, Ironman races, CrossFit challenges, marathons, stair climbs, bike races and more. Whether you’re looking for a great reason to run or motivation to push yourself through another marathon, we have a spot for you on the Charity Team. Raise your left hand, then smack it with your right hand. Register for any athletic event of your choice. Note: Our guaranteed entry spots for the 2019 Bank of America Chicago Marathon are now available – and we have more available than ever before! Grab a friend and sign up together! We’ll help you set up your personalized fundraising web page (super easy!) for safe, convenient online donations. *Deadline for donations is 30 days after your chosen event or 10/31/2019 for the Chicago Marathon. When that marathon playlist just isn’t bringing out the jams, Charity Team runners find that extra push from the amazing – and loud – Charity Team Road Crew. If you have questions or would like to know more about becoming a Charity Team Member, please reach out to Becky Evans. She can be reached via email or by calling our office at 312-624-8079.